After all our enthusiasm for the One Laptop Per Child initiative (OLPC) it was amazing to be able to spend the last two weeks testing one out for real (thanks Seb!). leads the field in several key directions, but might be superceded quite quickly? There are so many competing views and agendas around this little green machine that we felt the best way to review it would be collaboratively. We got the entire Tribal learning technologies team in on the act, including animators, UI designers, teachers, academics and programmers. We also enlisted the real experts: our kids! (aged 6, 9 and 11). The XO is all about sharing. It has a great visual representation of available local networks, and of the people in your group. This is all about kids doing stuff - and building stuff - together, the collaboration is hard-wired into the system. Seymour Papert lives on. The XO includes great tools (like pippy and turtleart) to help everyone develop basic programming - and from that problem solving skills. The interface is interestingly different, without being counterintuitive ... even for those of us wedded to the Windows / Mac metaphors. good extensibility, with plug-and-play for standard USB peripherals (useful for an extra mouse and keyboard if you have got grown-up fingers - the keys are tiny!). Useful fold-back screen and mouse / tab controls on the screen casing. What it really cries out for in this mode is a touch screen, though. This device, more than any other we have seen, is all about kids. All about sharing. All about communicating and problem solving - in fact all about learning. 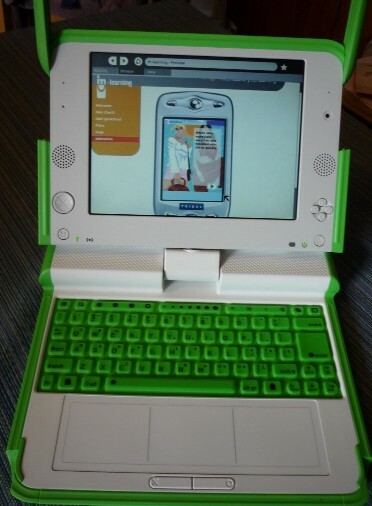 OLPC should be a wake-up call for the first world as well ... why aren't we giving our kids the same tools? Slow and Unresponsive. This may sound ungrateful for such a cheap device, but bad responsiveness very quickly becomes a barrier. You can load multiple apps, but with two or three running at the same time the delays between mouse-movements and on-screen responses get so slow that many apps become unusable. Even drawing a single line in Paint results in a series of disconnected bits. The mouse pad: it looks like there are 3 mouse-pads, but only the central one works. You finger has no cue that you have moved onto one of the not-working pads so you keep "loosing your mouse". The pads need raised lines to separate them. The mouse buttons: need to stand out a little more. They are sunk-in, so tricky to use. Integrating with Sugar: the Linux interface being used (called Sugar) lets you access the main menu by moving your mouse to the 4 corners of the screen. A great idea, but several of the bundled apps also use the corners of the screen for menus and icons, which means the menu pops up by mistake when you want to use them! Even our veteran Linux developers struggled to find out how to upgrade what. It needs a single application to display all the technical information. For example: hardware version, software version, flash player version, security settings etc. Without this it is very fiddly to upgrade. We love the fact it has had so much philanthropic energy put into it, and the bold, exploratory and collaborative ideals it encompasses. But we were frustrated enough with the speed and some of the interface quirks to give it the thumbs down until the next version gets released. If those get sorted, and it gets a touch-screen added, it will be one amazing device! Review by Geoff Stead and the team at www.m-learning.org. Their blog is at moblearn.blogspot.com.